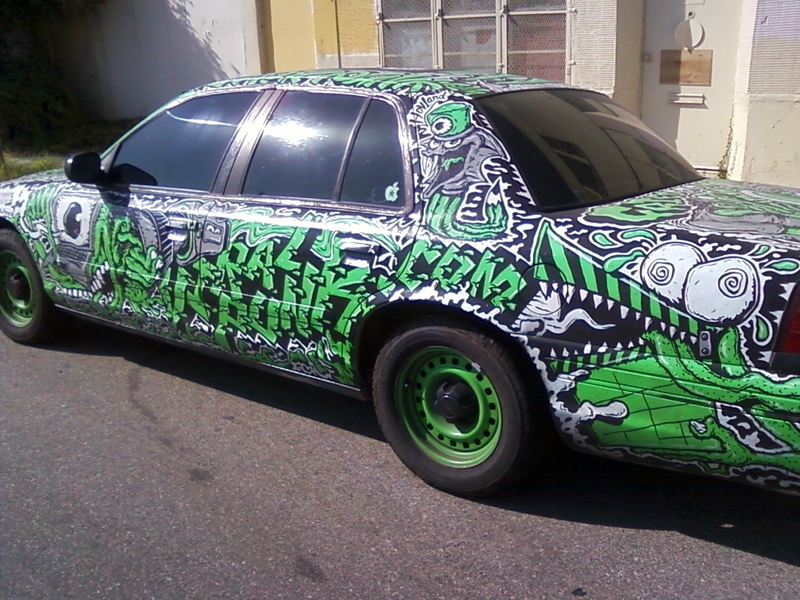 I recently saw this car as I was driving down Jefferson and I had to stop, get out and snap a photo with my phone. I never do this. That’s how awesome I think this car is. I’m not crazy about the green and silver combination of colors, but considering it’s a car I can’t blame the owner for choosing not-too-alarming colors. Actually, I love green. What I like most about the car’s design is that it covers the entire body of the car, even the inside metal of the tires are green. It’s graffiti-inspired and conjures up gritty thoughts of sewers, boogeymen, monsters and goblins. I like that it’s grimy and feels like it might be the getaway car of a villain, possibly the Green Goblin.